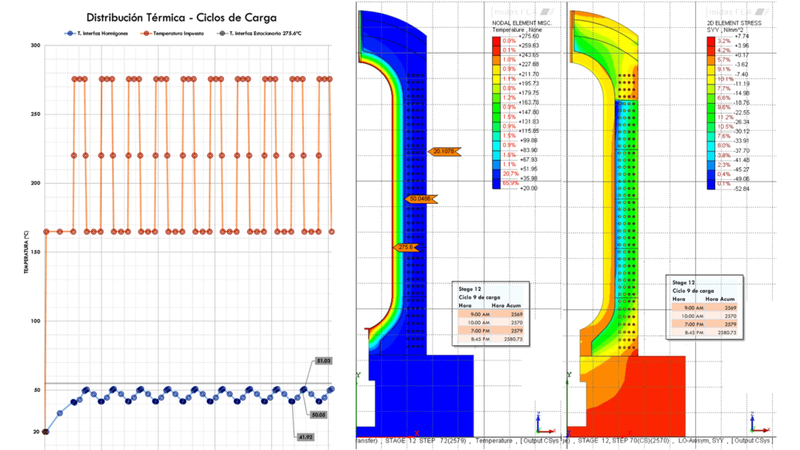 The project includes the structural design of a scale prototype of a concrete tank as steam accumulator for a capacity of 4500 m3 and 130 bar pressure. The structural system is bilayer + liner, reinforcing the importance of the post-tensioned wall insulation and the effect of thermal gradient. The tendon system allows greater circumferential pressure than the bar system, despite of having higher friction losses. The large tendons, optimize the post-tensioning force by tributary area, so it should be used those higher number of strands that technologically can be post-tensioned taking into account the small radius of curvature. The thermal gradient in the post-tensioned vertical wall is responsible for tensile stress, hence it has been chosen the employment of a ultra-high performance concrete with great tensile strength, consequently, the vertical post-tensioning can be avoided.